Interior Car Window Notice Sticker. 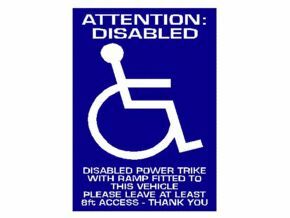 Attention: Disabled - Wheelchair lift fitted to this vehicle; Please leave at least 8ft access, thank you. I actually bought this for my cousin who has a disabled husband. People were parking too close for her to get the ramp down for the wheelchair. Solution now solved! Quick delivery. Thank you. Very good and clear to read. Would recommend to a friend. The item was great but I was under the impression it was for a trike and it was a sticker that was for a window screen in vehicle not a trike that is outside vehicle that I needed. The trike I have has no were to put a sticker like this. Exactly What we wanted and promptly delivered. Couldn\'t have asked for more. Always good service from active mobility and free delivery on all orders no matter what value !!!!!! Sorry but when fitted to my VW Caddy Maxi no one can see the disability notice through the tinted window, at the rear or the side windows. If you do make the same sticker to fit on the outside of the vehicle I would be most interested. Les Chance.